Travel ultra light and assured with Maxlite 4. 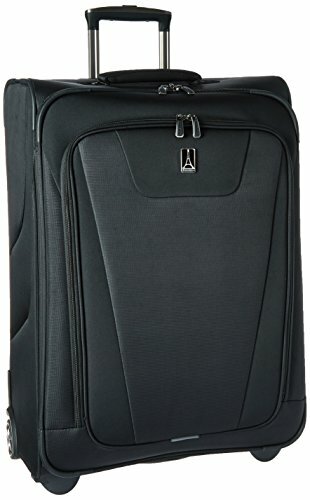 This extensive collection features 11 singularly lightweight and durable Spinners and Rollaboards with the look and quality of much more expensive luggage. The 26 inch Expandable Upright Features: Water repellent coating, inside and out. Telescoping handle adds length and strength Stops at 38 inch and extra-tall 42.5 inch. High performance ball-bearing in-line wheels. Protective crash-guard wheel housings. Honeycomb framing system integrated with bottom tray provides outstanding lightweight durability. Exterior ticket pocket on Carry-Ons. Low-profile carry handles. Tapered 2 inch expansion designed to enhance stability Full-size zippered lid compartment. Zippered side mesh pocket. Adjustable hold-down straps with Duraflex anti-break buckles. If you have any questions about this product by Travelpro, contact us by completing and submitting the form below. If you are looking for a specif part number, please include it with your message.